GoFormz has a robust reporting engine that lets you generate reports based on form data. You can choose a set of columns to report on, apply filters to the resulting report, order and sort the columns, generate summaries, and even add charts and graphs to your report. This article will go over all of these capabilities. Here are the steps for creating a report in GoFormz. 1. Begin the creation process. To create a new report, navigate to the Reports Tab and click the Create button in the upper right. The Report Editor will appear. Fields for the report can be selected from the left side of the editor, filters are along the top, and some brief instructions appear in the report preview area. For more on the Report Editor layout and capabilities, please refer to the Report Editor article. 2. Add template. To create a report for a specific form template, select the template from the Form template dropdown menu in the top left corner of the editor. All the fields for that template will appear in the Available columns area. In this example we selected the Sample Work Order template that comes standard with your GoFormz account. Note that in addition to the fields from your chosen template, there are several Shared Fields — like form Name and Id — that are common across multiple templates. You can also choose (Shared Fields) from the Form template dropdown instead of choosing an individual template, allowing you to create a metadata report across all your templates. See here for more on Shared Fields and Multi-Template Reports. 3. Add columns. To add columns to a report, simply drag the fields you want in your report to the report preview area. The preview immediately updates to show sample data; note that this is sample data only — you will not see all entries from your report here. In this example, we've added the Name, Date, Customer Name, Total Cost, Total Hours, and Technician columns. 4. Apply filters. 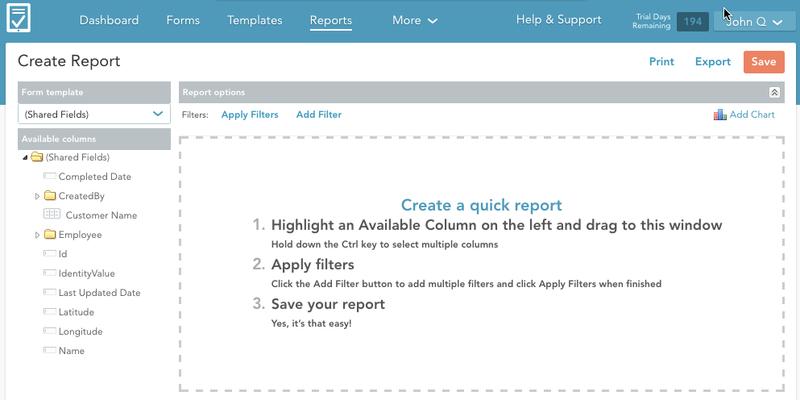 Applying filters to your report allows you to limit the report to just the information that you want. You can add filters in the Report options area at the top of the editor. Just click Add Filter and choose the options you want. You can remove a filter at any time with the Remove button. After adding or removing a filter, don't forget to click Apply Filters to save your changes and update the view in the report preview area. To learn more about filters, read the Applying Filters article. In this example, we have added two filters to the report — the first limiting the range of dates, and the second specifying a technician. This report will only include data from forms filled out by Brent after 12/01/2015. Rearrange the columns by clicking a column name, dragging it to the left or right, and dropping it in the desired position. Change column width by hovering between two column names until the resize cursor appears, then click and drag left or right to resize the column. 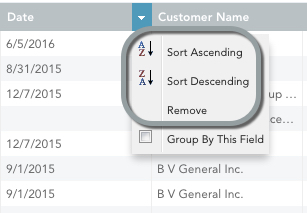 Sort on a column by hovering over the column name, clicking the small dropdown arrow that appears, then selecting Sort Ascending or Sort Descending to perform the sort. Remove a column if you’ve added it in error by selecting the Remove option in the dropdown menu. In this example, we’ve rearranged the columns in a more logical order, changed the widths so the data fits, and sorted by date. 6. Create groupings and summary columns. The next step is to select a column to group on. Grouping on a column will subdivide your report into groups based on the values in your chosen column. In the example below we grouped on the Customer Name column — and you can see that the report is now divided into 4 groups, corresponding to 4 different customers. To create a group, hover over a column name, click the dropdown arrow that appears, and select Group By This Field. Perhaps the biggest value of grouping is that it allows you to create summary columns. Once you’ve created a grouping, open any other column’s dropdown. You will see additional options here that were not present before you created the group — Count, Sum, Min, Max, and Avg. Select one of these to create a summary column using the chosen operation. In this example, we’ve created summary columns from Total Cost and Total Hours, using the Sum operation for both. In other words, the report shows the total cost and total hours summed up by customer. See the Grouping and summarizing report columns article for more on these concepts. 7. Add a chart. You can add a simple chart to your report by clicking the Add Chart button in the Report Options area. The Chart Designer will launch, letting you create line, bar and pie charts. Note that you must have at least one summary column in your report before you can create a chart. In this example, we’ve generated a chart on total costs by customer. See here for more on adding charts to your report. 8. Save your report. 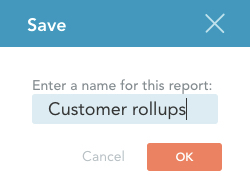 When you're done setting up your report, click the Save button at the top, then give your report a name in the dialog box that appears, and click OK. Once the report has been saved, you can access it in the Reports Tab, where you can view the report and perform other operations like exporting, printing, copying, etc.